Preheat the oven to 375 degrees. Peel apart the individual cloves of garlic, but leave the skin on. Put the garlic on a baking tray and drizzle with olive oil. Bake for 20 minutes until garlic is fragrant and slightly browned. While the garlic is roasting, heat 1 1/2 Tablespoons of olive oil in a pan over medium heat. Add the chickpeas to the pan, then add the cumin, paprika, and ginger powder and stir to coat evenly. Let sauté for 5 minutes, then stir. Let sauté for another 3-5 minutes and stir again. Take garlic out of oven. Once the garlic is cool enough to be handled, squeeze each clove out of the skin/peel away the skin (It should come out easily). Add cloves to the chickpeas and smash them a bit, being careful not to smash the chickpeas. Stir and let sauté for a few more minutes. Add dressing ingredients to a bowl and whisk to combine. Add hot water as needed to thin. 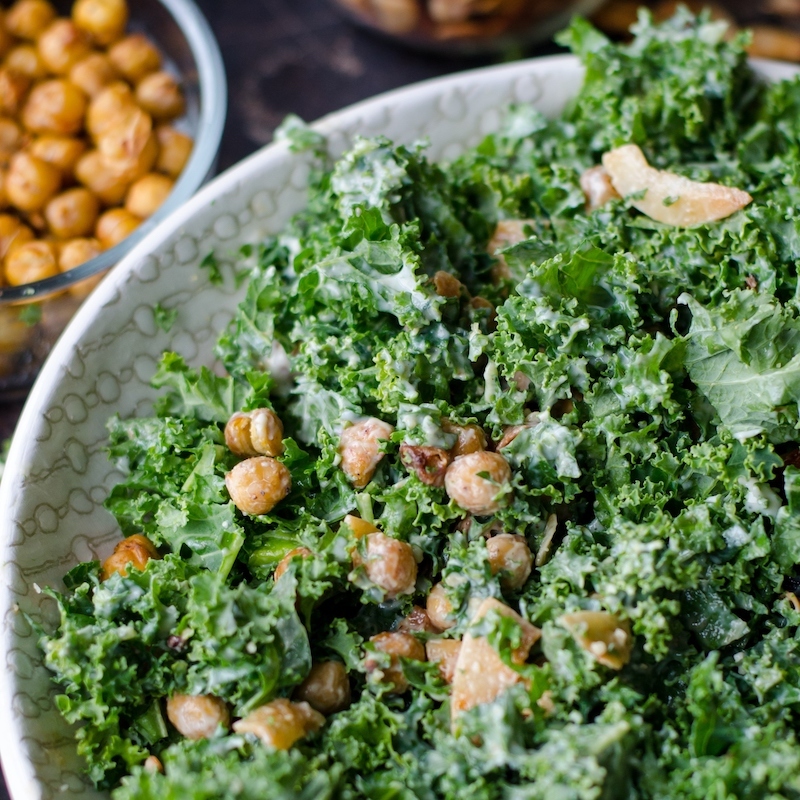 Add the kale and 1 Tbsp each of olive oil and lemon juice to a large bowl. Before adding the dressing, massage with your hands to soften the texture and lessen the bitterness of the kale, and making it easier to digest. Add as much dressing as you want and toss (save the leftover dressing). Top with chickpeas, serve, and enjoy!